Texas based Lula Houp-Garou, the Ingenue with Ingenuity discusses Sabrina Chap‘s Vaudevillian inspired European Tour and her new album, We Are the Parade. Chap’s last album, “Oompa!” – a delightful ragtime and cabaret inspired romp – secured her place as a favorite travelling performer in the American burlesque and vaudeville circuit. Many a burlyq’er has swooned over the ecdysiastic possibilities for the saucy track, “Never Been A Bad Girl”, and audiences across America have been titillated speechless by the deceptively sweet and shocking “The One Thing I Have Never Done.” (Alternately titled, “The Dirty Song” – not available on either of her albums, but a frequently-requested live crowd favorite.) She’s even rewritten the classic jazz ditty “Booty Swing” (revamped to “Burlesque Booty Swing”) to pay name-dropping tribute to just a few of the various burlesque beauties that she’s shared dressing rooms and drinks with across the country. 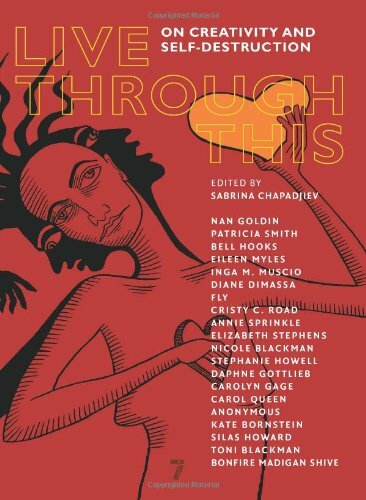 It’s a scrapbook of human experience – and each track is further evidence of hard-earned growth, both personal and artistic. The lyrics reflect not only Chap’s trademark wit and raunch, but also soul-searingly honest emotional reflection and world-weary political satire. The catchy melodies of “Oompa” have given way to fascinatingly complex orchestrations that mimic the indescribable drama of ordinary human emotion. 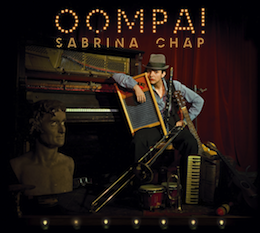 Chap’s distinctive voice is supported by over 25 musicians, and backed by Brooklyn post-punk soul band Ava Luna, who chime in with doo-wop choruses, Andrews Sisters-esque crooning, and occasionally, cheerleading chants. The album incorporates such a wide variety of musical influences – ragtime, dixie, swing, cabaret, soul, blues, latin, big band – that each song feels like a postcard from a different time and place, with notes and anecdotes scribbled across the back. Ultimately, the album serves as a peek inside the dusty, well-worn suitcase of this ambitious contemporary American artist and world-traveller. …But are these truly momentos and dog-eared diary pages on display, or novelty amusements and miracle elixirs carefully curated for your benefit? 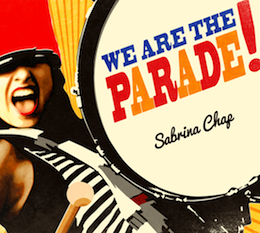 You’ll have to “take a chance on this quick romance” with Sabrina Chap and decide for yourself. Either way, she’ll fix you up good. Or check her out live! She’ll be touring the UK this fall – performing at burlesque shows, queer parties, and cabarets, as well as lecturing on mental health and creativity. You can find the complete tour details below, as well as here. All dates 2013. Nov. 23 – The Gatsby Club Glasgow University Union 32 University Avenue Glasgow G12 8LX United Kingdom 8:30 pm £14.00 Tickets. Facebook event. ALSO Nov. 23 Sabrina Chap – Full Cabaret Set Riding Room 58 Virginia Street Merchant City, G1 1TX Glasgow, United Kingdom 11 pm. Facebook event. Nov. 24 – Dive Cabaret/Burlesque Edinburgh Nov. 26 – Bar Wotever Royal Vauxhall Tavern 372 Kennington Lane, SE11 5HY Doors 6pm-Midnight, on stage 8.30 Entry Free, but we will shake that bucket to help covering travels etc.. Facebook event. Nov. 29– La Boheme Burlesque La Boheme Cross York Street, Drinks – 7 pm, Show – 9 pm. Facebook event. This entry was posted on November 17, 2013 by coochiecrunch in Coochie Crunch Blog and tagged Lula Houp-Garou, Music, Reviews, Sabrina Chap.